Client/Server certificates have been leveraged to secure access to Docker API hosts on any traditional Docker implementation. All of them can be speficied during VCH creation. Obs: the examples you will see bellow are simplified deployments just to facilitate understanding. VCH’s creation has many deployment options. With this method, the user does not have to provide any certificate to authenticate to VCH endpoint, also the traffic between them is not encrypted. This method is NOT recommended for production nor non-trusted environments, but I understand the simplicity of it when it comes to quick demos and POCs. 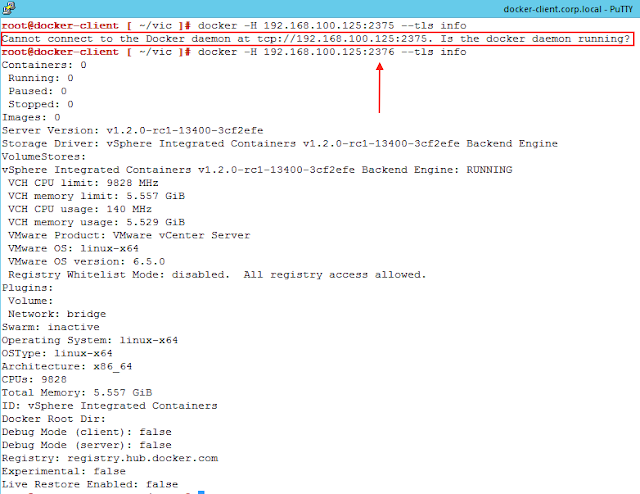 One last thing, in this case, the Docker API service is listening on port 2375. Just provide --no-tls option during VCH creation. After creation, you can access it just pointing to its API endpoint, in fact anyone can just do that, as long as they know it’s IP address, you see now why it’s not secure or recommended ?!? Like the previous one, the user does not have to provide any certificate to authenticate to VCH endpoint, but now the traffic between client and VCH are encrypted. Again, since it does not provide any authentication mechanism it’s not recommended for production. 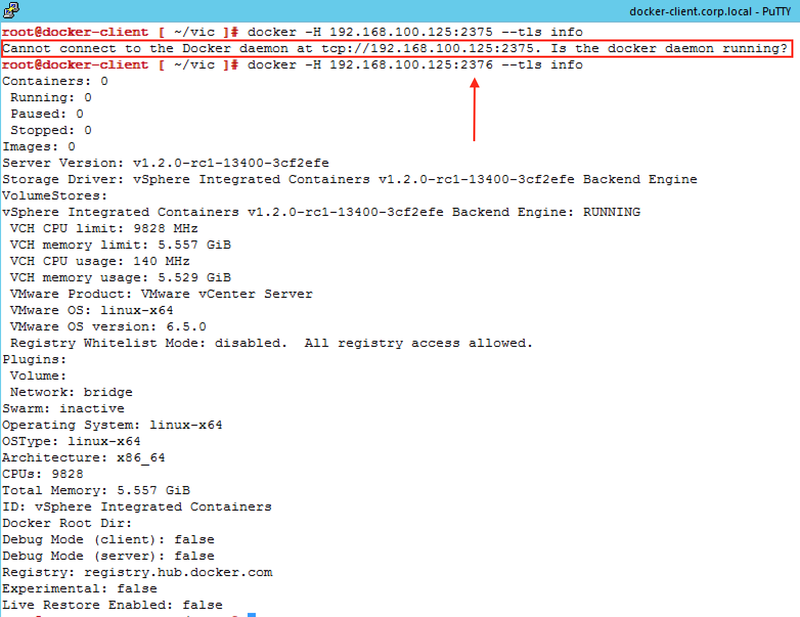 With the traffic being encrypted the Docker API service is now listening on port 2376. You just need to provide --no-tlsverify option during VCH creation. Even though no authentication is required, VIC will create certificates, which will be used to encrypt the traffic. But you don’t need to worry about it. As I said before, the endpoint is not listening on port 2375 anymore, you will need to use port 2376. 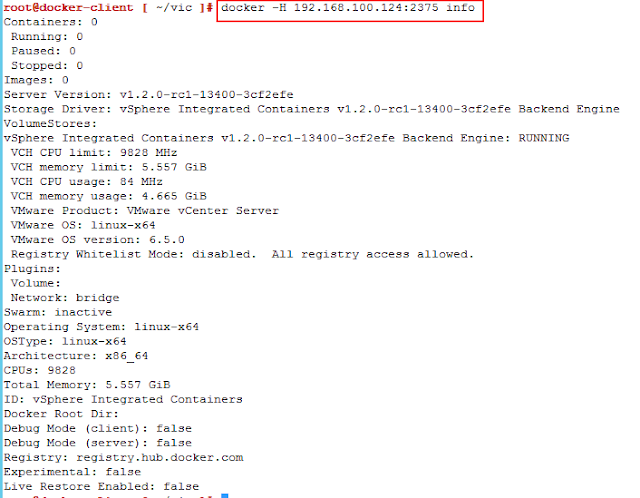 Again anyone can just point to the endpoint’s IP and start issuing Docker commands, no authentication is required. I think it’s enough for a post. Next one is when things get really interesting, let’s protect our VCH with two-way authentication.